While winds howl, frost bites and snow falls, people dream of getting away from it all. Every year around this time, we see an uptick in searches for spring and summer travel from people who have had it up to here with winter. And in the middle of one of the coldest, snowiest, iciest winters on record in the U.S., you better believe people are gearing up to grab their suntan lotion and their carry-ons, and hop on a plane. Enter Google Flights, which makes it easy to plan the trip that’s right for you. Here are a few tips to help you book this year’s dream vacation. There’s a travel myth that you can always find the best deals on Tuesday. But actually, you can find good deals any day of the week—especially if you’re flexible with your travel dates. Though it’s sometimes hard to pull the trigger because you’re afraid the price will drop tomorrow (or next Tuesday, maybe? ), our experience shows it’s usually best to book right away. 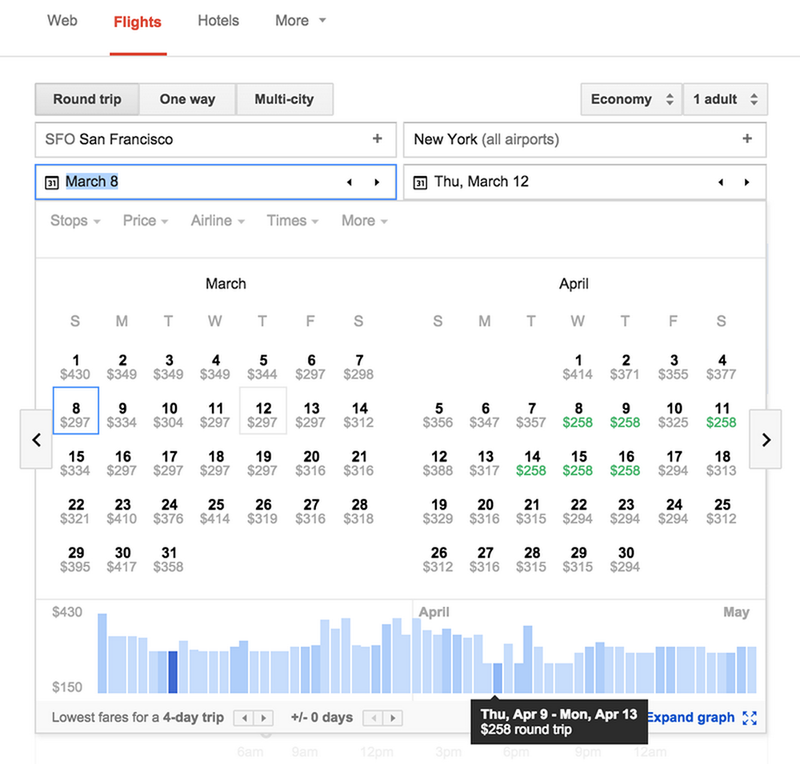 Regardless of which day you sit down to plan your trip, you can use the calendar in Google Flights to scroll through months and see the lowest fare highlighted for each day. If you’re planning even further out, use the lowest fares graph beneath the calendar to see how prices may fluctuate based on the season, holidays or other events. You can also set preferences (such as direct flights only) and our calendar will adjust to show you just those flights and fares that fit the bill. Finally, if you can save more by using a nearby airport or flying on a different day, we’ll show you a tip at the top of your results. Sometimes, you know exactly where your destination needs to be—say, when you’re taking a business trip, or headed to a wedding or family reunion. But there are times when all you know is that you want to go somewhere. Maybe you want to go somewhere with a beach, but don’t care if it’s in Greece or the Caribbean. Or you want to visit Southeast Asia, but aren’t sure which countries to visit. Our research shows more than half of searchers don’t know where they’re going to travel when they sit down to plan. With Google Flights, you can search for regions or whole countries, like “Flights to Europe” and “Flights to Mexico." Or, expand the map to scan the entire world and see accurate prices for all the different cities you can fly to, along with filters for your flight preferences. If you’re in a particularly adventurous—or lazy—mood, select the “I’m Feeling Lucky” button on the map and we’ll suggest ideas for where to go based on popular destinations and your past search history. We all love a good deal, but when it comes to choosing flights, cheaper doesn’t always win—and no wonder, when sometimes that means two connections instead of none. 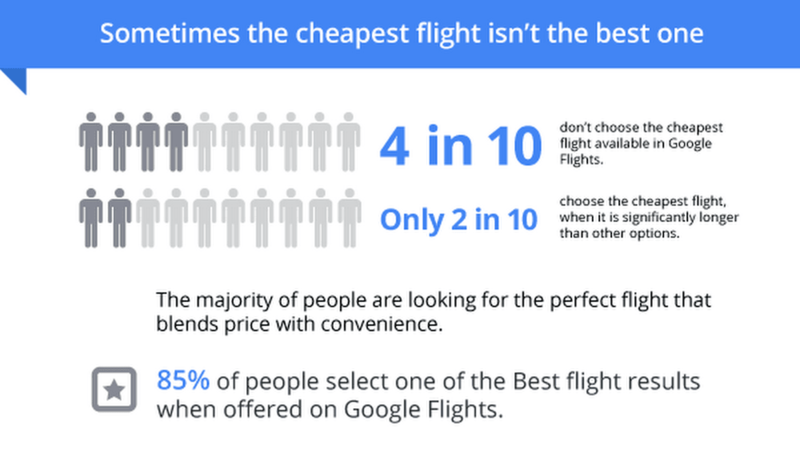 On Google Flights, the vast majority of people choose one of the Best flights—considered to be flights that are the best combination of price and convenience. Try it out next time you’re looking for something that fits your schedule, not just your budget. So once you’ve warmed your hands on that cup of hot cocoa, put them to work on your keyboard or phone. Google Flights is ready to find the best destinations, dates, fares and flights for you to get away from it all.